Canal near to my house. Shot on an IR converted GX1 but with an IR850nm filter on the lens. Halation effect added in Photoshop. Over the weekend I published my spring newsletter. Those of you who subscribe and who have had an opportunity to read the latest issue will know that the main article explores the options for infrared photography (including some that cost very little). As I was writing this it got me thinking that I wanted to shoot some Infrared film using my Hasselblad XPan which I haven’t used for about a year. Choices for film are very limited these days so it was either Ilford SFX (which isn’t really a true infrared film) or Rollei IR400. 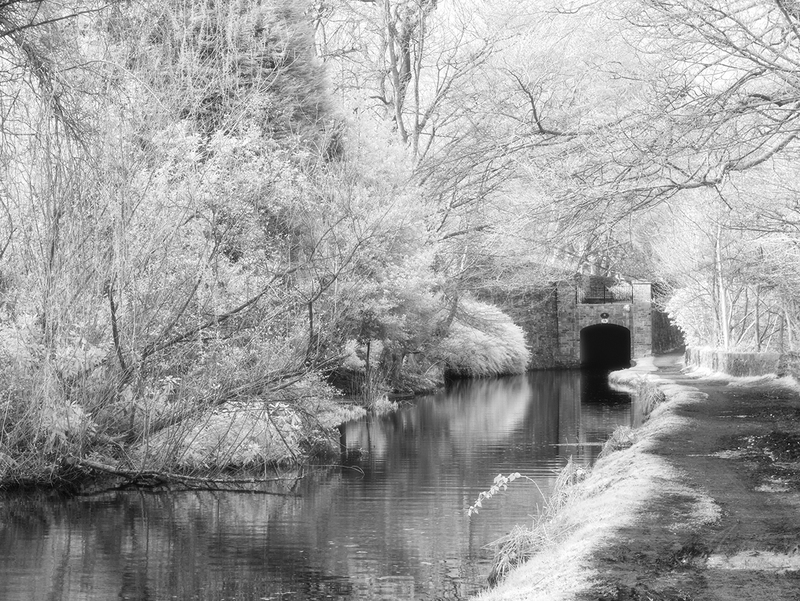 I purchased a few rolls but realised I didn’t have a 49mm Infrared filter for the XPan lens, so needed to turn to eBay. I also realised I had sold my light meter thinking (incorrectly) that I wouldn’t need it again, so ended up needing to buy another. Anyway, whilst searching for a 49mm Infrared filter (720nm strength) I also had a quick look for an 850nm Infrared filter and found quite a few. For anyone who is unfamiliar with these filters they will block out light with a wavelength shorter than the filter strength. For example a 720nm filter blocks light with a shorter wavelength, effectively blocking visible light but allowing infrared wavelengths through. The reason for wanting a 52mm 850nm IR filter (which incidentally only cost £10 including postage) was so I could use it with my Infrared camera. When I had the camera converted to infrared I had a choice of having it fitted with either 720nm filter or an 850nm filter. The 850nm filter gives a more dramatic effect and can only be used to produce black and white images. I opted for the 720nm filter as this allows you to create some false colour effects. By using a screw in 850nm filter on the lens it’s like having my camera converted with the stronger filter. When the new filters arrived I checked them. The 720nm filter made no difference to the IR camera but blocked the visible light from a standard (unconverted camera) so I knew it was a good filter. The 850nm filter when attached to a lens on my infrared camera caused a loss of about 2 stops of light making it very usable for handheld shooting. It also caused a colour shift to blue in the image but this is probably because I didn’t bother setting a custom white balance. The blue tint was easily corrected during the RAW conversion. Now here’s the interesting thing, when I used the 850nm filter on the infrared camera, although the shutter speed was slower by 2 stops, the image quality was better. I didn’t take sufficient images to check this out properly but across about 10 scenes, the 850nm images appeared to have sharper and finer detail in all cases. I can’t explain why as in fact I had expected the opposite to happen. I’m going to keep a close eye on this as the light starts to get stronger and better for shooting infrared. Did you ever use an external IR filter with your Canon 5D Mk 2? if so which one did you use? When you were searching around did you come across an 850nm version that would be good for my 5D? Also, where did you locate these filters please? No, I never tried an IR filter with my 5D before I sold it. I wouldn’t expect it to work too well given it was one of Canon’s premier cameras and would have expected them to fit it with quite a strong IR filter. Based on this I would suggest trying it with a screw in filter on one of your lenses. Go for an IR720 as the stronger filter may just block too much light and make exposure almost impossible. The filter I bought was from Flying Photo and seems to be good quality as it made no difference to exposure times when used with my IR converted camera. Here is a link http://www.ebay.co.uk/itm/Pro-Quality-77mm-IR-Infrared-720nm-Filter-/141229823330?pt=UK_CamerasPhoto_CameraAccessories_CameraLensesFilters_JN&hash=item20e1f41562. I’m not sure what diameter your lenses are so you may need to search their range.